17.5: bright, fairly large, elongated 5:2 SW-NE, 5.0'x2.0', mottled patchy appearance, small elongated brighter core but no nucleus. A mag 15 star is 2' off the NW side. 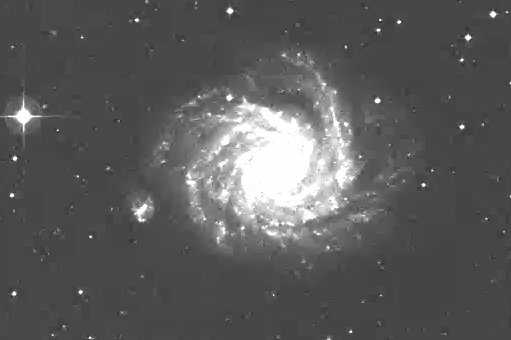 Faint spiral structure visible with concentration. An extremely faint arm is off the NE end curving towards a mag 14.5 star to the NE 3.7' from center and a second extremely faint arm is just visible off the SW end curving to the S. Forms a pair with N4085 11' SSW. 8: fairly bright, elongated SW-NE, weak concentration, cigar-shaped. Forms a pair with N4085 11' SSW. 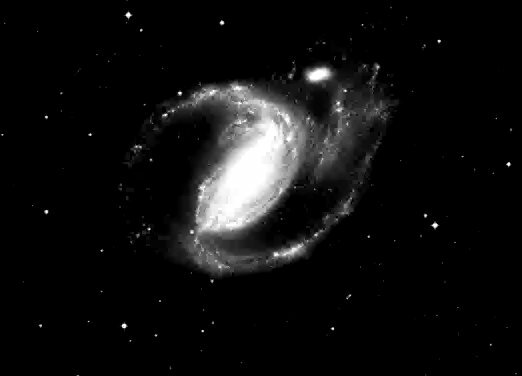 13: fairly bright, round, moderately large, broad concentration, possible stellar nucleus. A mag 14 star is off the ENE edge 1.0' from center. 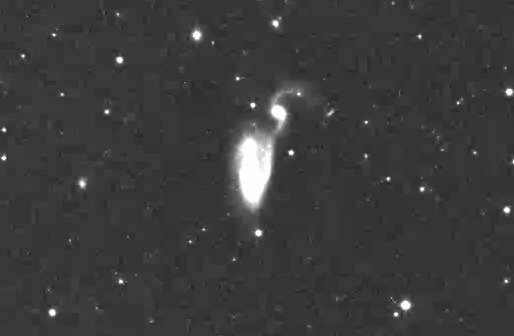 A spiral arm is suspected N of the nucleus trailing to the E.
8: faint, moderately large, no details. 17.5: bright, large, slightly elongated, bright core, very large faint halo. Located 8' WSW of mag 8.6 SAO 168347. 13: large, large bright core, substellar nucleus, very diffuse outer halo. An arm is suspected attached at the W end and winding towards the E on the N side of the core. 17.5: very bright, very large, very elongated NW-SE, very bright core. 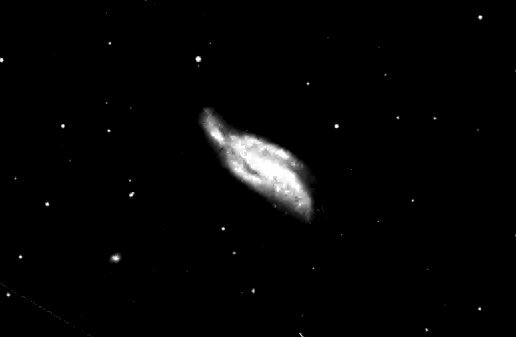 A companion galaxy N1097A is attached at NW end. 8: bright, elongated NW-SE, bright core. 17.5: very faint, very small, round. 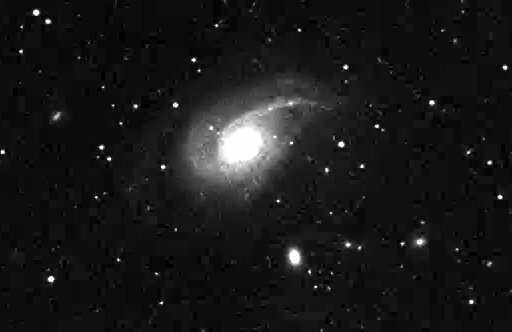 This galaxy is attached at the NW end of N1097! 13: bright, moderately large, slightly elongated, sharp concentration. Forms a close pair with N770 3.5' SSW. 8: fairly faint, fairly large, oval, bright core, two mag 11 stars to SE. 17.5: this is the fainter northern member of a contact system with brighter N5395 connected at the S tip (2.0' between centers)! Fairly faint, very small, round, brighter core. 17.5: fairly bright, elongated NNW-SSE, bright core, small bright nucleus. A mag 13.5 star is off the S edge 1.7' from center. There is an impression of a dark lane on the W side and an extremely faint arm beyond the lane (agrees with POSS). Forms a contact system with N5394 at the NNW edge! 17.5: moderately bright, moderately large, slightly elongated SSW-NNE, smoothly increases from halo to a bright core and an almost stellar nucleus. The halo extends to almost 2' diameter with averted vision and fades into background. Forms a striking pair with N3227 at the S side with 2.3' separation between centers. The outer halo is just in contact with N3227 at the SSE edge. N3222 lies 13' W.
17.5: fairly bright, fairly bright, elongated 5:2 NW-SE, 2.5'x1.0', prominent very small high surface brightness core, striking stellar nucleus. 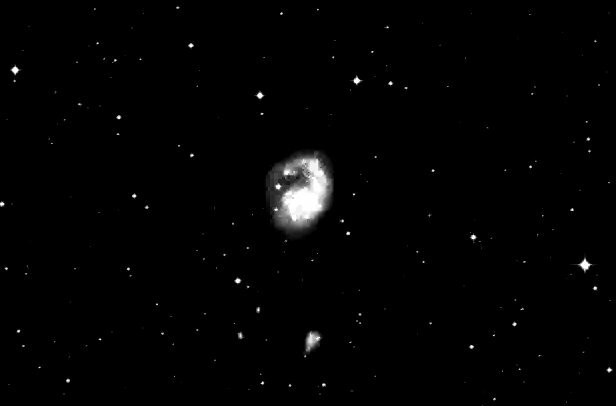 Just in contact with N3226 at the NW tip 2.3' separation between cores. 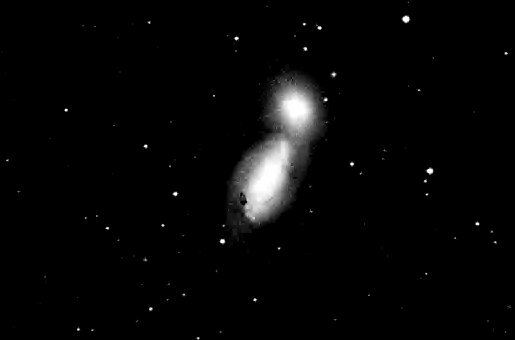 Brightest of three with N3222 13' W.
13: fairly bright, elongated, bright core, stellar nucleus. Forms a contact system with N3226 2' NNW.